The UC San Diego men’s volleyball team opened its 2018 season this weekend, playing in the Wooden Classic Tournament at the John Wooden Center in Los Angeles. Facing off against McKendree University and King University, UCSD emerged victorious in both contests. With back-to-back wins, the Tritons rise to an overall record of 2–0. In the opening set, the Tritons started off hot, leading 12–6 early. 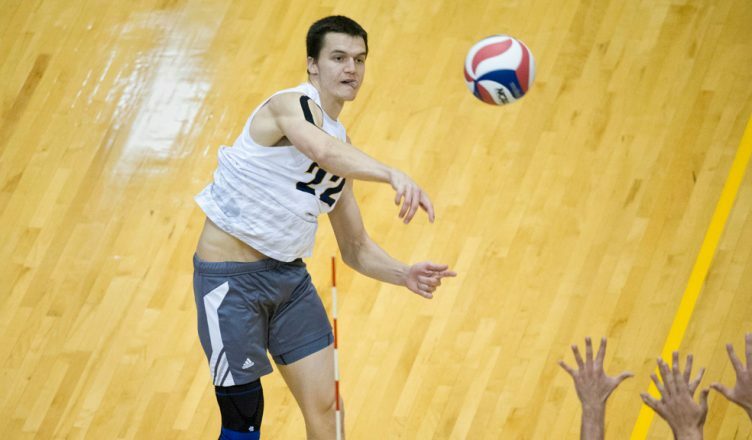 Back-to-back service aces by Senior Tanner Syftesad sparked UCSD’s fast start. However, McKendree was able to mount a resilient comeback effort. Though they never claimed a lead, the Bogeys were able to even the score five times before UCSD won the set 25–22. After that, UCSD exchanged sets with McKendree: 22–25, 29–27, and 21–25. The game came down to the fifth and final set. After getting off to a slow start, the Tritons were able to pull even with the Bogeys 13–13. Wasting no time, freshman Wyatt Harrison quickly scored twice, sealing a UCSD victory, 15–13. In a very competitive and balanced match, the Tritons were able to outlast the Bogeys in five sets. Tanner Syftestad was fantastic, accounting for a game-high 27 kills on the night. On defense, redshirt senior Bryan Zhu put together a nice game, tying Syftestad for a team-high 5 block assists. After a challenging and drawn-out contest the day before, UCSD took care of business against King University, winning 3–1. The Tritons started off strong, blowing the Tornados out of the water in the first set. A kill by Harrison gave UCSD their first lead early in the set and King was never able to catch up. The final score was 25–19. The second set was a much closer game. UCSD was able to establish a lead early on, but King kept them from running away with the score. The game was eventually tied 17–17, but the Tritons were able to hold off the Tornados. A final kill by Tanner Syftestad closed the set at 25–23. In the third set, it was the Tornados who flew out to a fast start. King had an effective offensive performance early — combined with several UCSD errors — and was able to pull ahead by seven points (14–7). The Tritons mounted a fierce comeback attempt, forcing three match points, but they were unable to seal the deal. The Tornados eventually won 28–26. After a disappointing third set, the Tritons rediscovered their mojo; they soundly defeated the Tornados 25–18. Syftestad posted another incredible performance. Syftestad accounted for 22 points, once again leading the team in scoring. He also had a nice contribution on defense, recording 7 digs and 4 block assists. UCSD continues its season this Thursday, where the team will play against UC Merced at home. The game will start at 6 p.m. at RIMAC Arena.